Please also see: Art History: Resources for Research. Periodical indexes offer you citation access to articles in periodicals. Some of these citations link to full text, while others do not, and will require you to find the paper journal to see the article itself. Core archaeological indexes ONLINE are preceded by an asterisk. Most of the listed indexes and bibliographies DO NOT in themselves contain online full-text articles. If they do not, to find out whether the articles in your citations are available online, search the Journal title (or book title) in CLIO. Be sure to note if the years covered online match the date of your citation. If you don't see a link to a PDF or HTML full text article, you may find an E-Link within many of the online indexes listed below. E-Link can be found as a button next to the citation. It provides direct links from a database citation to the full text of the article online (if available) or a link to the online journal. If full-text isn't available, E-Link offers to check CLIO, our library catalog, to see if the Libraries have what you need in print. E-Link will also help you submit an interlibrary loan request. Just click on the E-Link icon for a menu showing the options available to you. Bibliographic database on South & Southeast Asian art and archaeology, compiled by IIAS, covering articles, monographs, grey literature published 1990 to present. Please ignore the button telling at the top you to purchase access. 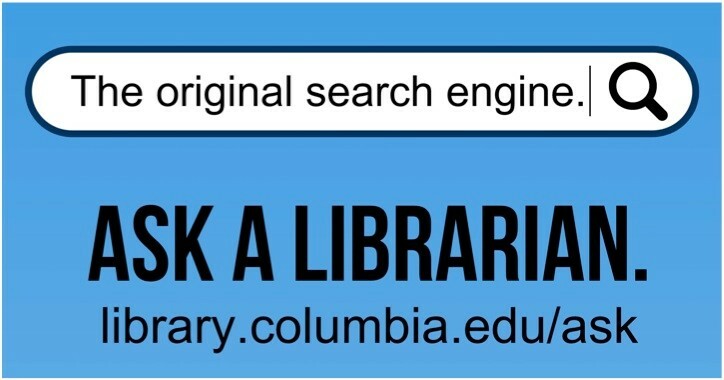 It is already paid for by Columbia University Libraries. Citation database containing journal articles from Italian academic journals covering the humanities and social sciences, classified using the Basis Classification in German and Italian. Subject, author, title and keyword index to articles, book reviews, and dissertations on the history and culture of the United States and Canada from prehistory to the present. The ancient arts of western and central Asia: a guide to the literature. by Bernard Goldman, 303 p., (1991). Classified annotated bibliography (books, journal articles, exhibition catalogs, archaeological reports, etc.) on the arts of those who lived anywhere from the eastern shores of the Mediterranean to the eastern borders of Chinese Turkestan and from the Ukraine and southern Soviet Asia to Pakistan and the Arabian peninsula. Chronologically arranged from Neolithic to the coming of Islam. The standard index of current literature for classical archaeology and philology. Annuario bibliografico di archeologia. (Istituto Nazionale di Archeologia e Storia dell’Arte, Rome), n.s. 1982-to date. Combines Anthropological Literature from Harvard University and the Anthropological Index, Royal Anthropological Institute from the U.K. Provides worldwide indexing of journal articles, reports, commentaries, edited works, and obituaries in the fields of social, cultural, physical, biological, and linguistic anthropology, ethnology, archaeology, folklore, material culture, and interdisciplinary studies. The index offers coverage of all core periodicals in the field in addition to local and lesser-known journals. Archäologischer Anzeiger. 1963 to date. Bibliographie, published annually since 1970 within Archäologische Anzeiger, lists completed dissertations in the field from German, Swiss, and Austrian Universities. Ceased. Now published in electronic form as Dyabola (1957 to date) (see below). Indexes international journals covering Europe, Mesopotamia, and Egypt. References arranged by subject. Separate subject, author, book review, and site indexes. No annotations or abstracts. Index to archival finding aids derived from major archival libraries and sources in the United States and the United Kingdom. Contains both detailed collection guides and records consisting primarily of summary descriptions of archives, manuscripts, and special collections. A bibliographic database that provides indexing and abstracts for academic journals, magazines and trade publications with full text for some, as well as selective coverage for a number journals beyond the scope of art and architecture that have articles appropriate to this index. Citations and abstracts for articles in science, technology, medicine, social science, business, humanities, and popular culture periodicals. This allows you to search through a massive collection of mostly full text journal articles, e-books, encyclopedias, images from ArtStor and conference proceedings. By default, it does not include newspapers, but you can choose to include newspaper articles from the search results page. If your search terms are unusual, this may work for you, but if the results are too big you should instead consider: 1.EbscoHost Research Database or 2. Proquest. Interdisciplinary index to books and articles. Can also search by citation, to allow you to discover who cites whom. Indexes periodicals in religion from 1949, multi-authored works from 1960, book reviews from 1975. Individual entries allow access to iconographic, epigraphic, social, chronological and geographic aspects. Descriptions of the picture motifs distinguish simple motifs, types and patterns. Some thumbnail images. Standard architectural periodical index, which also may include archaeology, mosaics, mural painting, architectural sculpture, etc. EBSCO: Disadvantage-different field terms should be entered in separate search boxes; Advantage-Avery call numbers found at bottom of citation. PROQUEST: Disadvantage: Avery call numbers not in record; Advantage: can put multiple terms in single search box. Use keyword to retrieve newer and older citations. Incorporates v.1-34 (1955-1997) of Art & Archaeology Technical Abstracts. Now it is compiled by the Canadian Conservation Institute (CCI), the International Center for the Study of the Preservation and Restoration of Cultural Property (ICCROM), and the National Archives of Canada. Indexes books, journals, dissertations, and exhibition catalogs. Covers Western art, all media, from late antiquity to the present. Includes RAA (Repertoire d'art et d'archeologie, 1973-1989; available in print for the years 1910 to 1989 at Avery-Fine Arts N2 R29). RAA covers late antiquity to the present; excludes Islamic, Far Eastern, and primitive art and archaeology. Jointly supervised by John Weeks of the Museum Library of the University of Pennsylvania and Sandra Noble of the Foundation for the Advancement of Mesoamerican Studies, Inc. (FAMSI), provides a comprehensive and continually updated bibliographic dataset of the published literature pertaining to the anthropology of Mesoamerica. Content includes archaeology, ethnography, ethno-history, art history, linguistics, physichumal anthropology, and other related disciplines. A companion to the index of articles in the International Medieval Bibliography Online, this database indexes books and book reviews on the same topics. Bibliographie der Deutschsprachigen Arabistik und Islamkunde: von den Anfängen bis 1986 nebst Literatur über die arabischen Länder der Gegenwart and 1987-1994 Nachträge. ed. Fuat Sezgin, 21 vol.(1990-1996). Classified unannotated bibliographies of German-language literature on the Islamic and Arabic world. Includes materials published up to 1986. Indexes to book reviews of works of fiction and nonfiction, reference works, textbooks, in the areas of art, biography, business, education, general interest, history, humanities, literature, library and information science, music, religion, science and technology, and social sciences. Index to book reviews from approximately 600 scholarly and popular English-language journals with links to more than 630,000 full-text reviews. Bibliography to current periodical literature on ancient Roman history. Citations lack annotations, but do include keyword, geographic, and thematic headings after each entry. Click on French or English version of Bulletin analytique… once at web site. Useful U-Tube tutorial from NYU. Database of texts and some images which document links between the art and architecture of classical antiquity and the Renaissance. Includes drawings, sketches, treatises, etc. as recorded in Renaissance documents illustrating the knowledge and study of classical antiquity by Renaissance artists. Useful tutorials (linked within catalog record): U-Tube tutorial from NYU. Citations to articles on classical, near eastern, and Egyptian archaeology, Byzantine art history, epigraphy, and numismatics. The print version, Archaeologisches Bibliographie ceased in 1993. Projekt Dyabola also includes other databases covering arts of the antiquities, e.g. Datenbank der attischen Grabreliefs des 5. und 4. Jahrunderts v. Chr (see below), Census of Antique Art & Architecture known to the Renaissance (see above), Corpus der Antiken Denkmaler, etc. When you get into this database, ALL of the 80+ indexes EBSCO offers are available to be searched simultaneously. Confusingly, the first index appears as if it was the only one being searched (Abstracts in Social Gerontology), but you are searching them all. If you search and the result it too big, choose our own indexes to search. Do this by clicking on “Choose Databases.” An alphabetically arranged list of indexes appears. Deselect them all, and then choose those that would make sense for your topic. Abstracts of books, periodical articles, book reviews, reports, etc., arranged by subject. Indexed by ancient and modern authors, geographical names, subjects, lexicalia, and literary and epigraphical sources. Now continued by FastiOnline below. Online version has coverage of excavations from 2000, begun in Italy and now expanding to Albania, Bulgaria, Macedonia, Malta, Montenegro, Morocco, Romania Serbia, Spain, Tunisia and Turkey. This database contains a basic record sheet for each site excavated for any period in a given year with, at the discretion of the site director, the interim report for the year, together with any further documentation the director wishes to add. There is no chronological limitation to the sites listed, which range from the Upper Palaeolithic to the nineteenth century, and reports on restoration projects and new museum displays are also welcomed. Sites are searchable by project name, by period and type of site, and by clickable maps which provide an overview of the excavation locations. Links will be provided to a project’s web site where possible. Bibliographic index to publications in the areas of Classical Philology, Ancient History, and Archaeology including monographs, dissertations (German and US), conference proceedings, etc. An international abstracting and indexing tool for research in the humanities, BHI indexes over 320 humanities journals and weekly magazines published in the UK and other English speaking countries as well as several newspapers published in the U.K. The database indexes, and from 1984 to date abstracts on articles, interviews, obituaries, bibliographies, original works of fiction, drama, and poetry, book reviews, and reviews of ballets, dance programs, motion pictures, musicals, operas, plays, radio and television programs. Indexes material on Islam, the Middle East and the Muslim world from periodicals, Festschriften, conference proceedings, monographs, multi-authored works, book reviews, websites, and other materials in European languages, Turkish, Malay and Bahasa Indonesia. Indispensable for interdisciplinary research, this index of periodical literature covers basic research from all fields of knowledge, and is particularly strong in the humanities and the social sciences. Over 11,000 periodicals are indexed by this multilingual database, now containing over 2.5 million records. It is international in scope, and indexes a significant proportion the periodicals published on the European continent. Bibliographic database of interdisciplinary journals pertaining to the Middle Ages and the Renaissance. Indexes over 1,700 journals published since 1784 as well as 12,000 scholarly collections published since 1874. In addition is has a online version of P.O. Kristeller's Iter Italicum, Baptisteria Sacra: an Iconographic Index of Baptismal Fonts, an International Directory of Scholars and more. Bibliography of books, journal articles, conference proceedings, etc. of Aegean studies, Homeric society, Indo-European linguistics, and related areas. Click on “Search: Nestor Database” to bring up search screen. Includes several 19th-century periodical indexes, as well as indexing of the New York Daily Tribune (1875-1906) and The New York Times (1863-1905). Combines the Annual Egyptological Bibliography (AEB) with Bibliographie Altägypten (BA). This resource offers peer-reviewed annotated bibliographies on specific topics in a growing range of subject areas. There are at least 50 specific topical bibliographies in each subject area thus far. The site offers introductions to each topic area, and including guides to introductory works, textbooks, guidebooks, journals, reference works etc., and links to useful websites. These bibliographies are browseable by subject area and are keyword searchable. Also contains a "My OBO" function that allows users to create personalized lists of individual citations from different bibliographies. An index to tables of contents of periodicals in the arts, humanities, and social sciences, including some published as far back as 1770. Includes periodicals in English, German, Italian, French, Spanish, and other Western languages. Provides access, where available, to page images in the related Periodicals Archive Online (PAO). Full title: Persée [electronic resource] : portail de revues scientifiques en sciences humaines et sociales. Provides full-text online versions of back issues of selected French journals in the humanities and social sciences. When you get into this database, ALL of the indexes Proquest offers are turned on. If your search result is too large, you can choose our own ﻿individual indexe﻿s. Do this by clicking on “# Databases” that is to the right of the word “searching at the top left of the screen. An alphabetically arranged list of indexes appears. Unselect them all, and then choose those that would make sense for your topic. Provides subject, title, and author access to almost all American dissertations accepted at an accredited institution since 1637. It also includes some U.K. and Irish dissertations. Masters theses have been selectively indexed since 1962. Full text of dissertations published since 1997 (and some from earlier dates) are available. Otherwise, request UMI dissertations from the Inter-Library Loan, or you can acquire them directly from UMI at full price. To order from UMI, call 1-800-521-0600. "TOCS-IN provides the tables of contents of a selection of Classics, Near Eastern Studies, and Religion journals, both in text format and through a Web search program. Where possible, links are given with articles of which the full text or an abstract is available online (about 15%). The project began to archive current tables of contents in 1992, and now contains ca 200 journals, and over 100,000 articles, in a database at Toronto. In addition, the Louvain mirror site archives much additional material for some of the journals before 1992. Searches of all data can be made at both sites..." Maintained at the University of Toronto.